What's the difference between a Convo and a Broadcast? Convos and Broadcasts share many characteristics. It's easy to get them confused! In general, Convos are a form of conversational content. The Convos Editor is the blank piece of paper where you write your interactive content. When we talk about Convos, we are referring to a piece of content 📜. Broadcasts, on the other hand, are a means of reaching out to your followers via push notification. When we talk about Broadcasts, we are referring to a tool for sharing content 📣. You can write a Convo within the Broadcasts screen and send it out to your followers right then and there, as the example above shows. 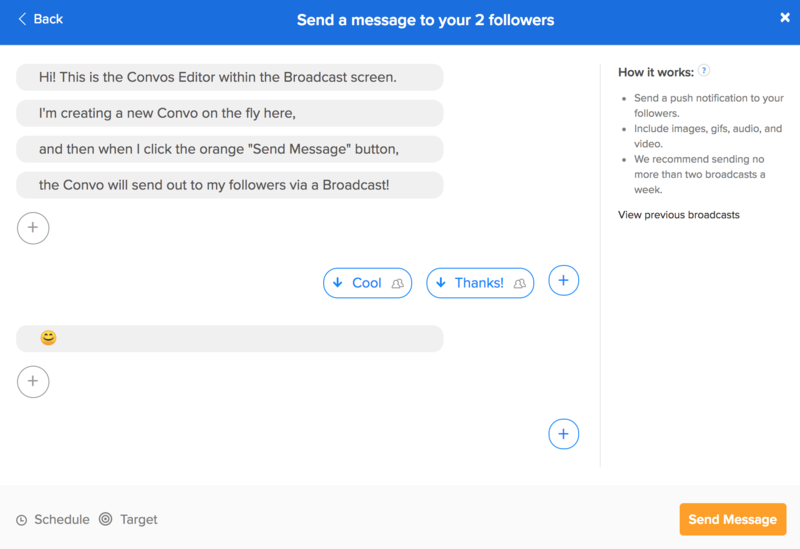 Or, you can pre-write a Convo elsewhere, tweak it for awhile, work on it with your team, and then share it via Broadcast when the time is right. Learn how to do that in this article. So, how do you know when you should write a Convo versus when you should draft a Broadcast?